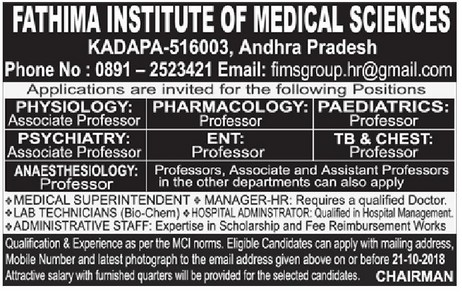 Fathima Institute of Medical Sciences, Kadapa has advertised in the EENADU newspaper for the recruitment of teaching faculty plus various non-teaching faculty jobs vacancies. Interested and eligible job aspirants are requested to apply on or before 21st October 2018. Check out further more details below. College Profile: Fathima Institute of Medical Sciences, Kadapa is promoted by MOHAMMADIYA EDUCATIONAL SOCIETY, a registered society in India. The area of operations of the society shall be initially confined to the Revenue limits of Kadapa district, and shall be extended to other places in Andhra Pradesh, as well as in other states in India in pursuance of its objectives. It belongs to AQJ - Group of Institutions. How to Apply: Interested and eligible candidates are requested to send their CV along with copies of certificates / mark sheets / experience certificates and recent PP size photographs to the following postal address or email address.